Too many trainees spend way too much time chopping and changing the exercises that they perform to get bigger and stronger. While variety is good, progression is better! If you want to get big and strong then be ready to lift some big, heavy weights. Just like most other things in life, getting big and strong also depends on developing a strong base, and a strong base in this case would mean getting very good at some of the basic lifts. They say in business that 80% of your earnings will come from 20% of your customers. The same also holds true in strength training. Getting big and strong will depend 80% on only about 20% of the exercises out there. This has been proven time and again by many big and strong men who have done it. Yet, unfortunately many around the world spend too much time focusing on the 80% of the exercises that fail to build impressive muscle size and strength. Ask someone who is trying to get big arms which are the basic exercises, and he will tell you curls and extension. Ask someone who wants to reduce his belly and he will give you a workout of 500 crunches. The truth however is that these are not the basic exercises. The basic exercises are big, compound movements where you work a lot of muscle fibres in one movement and can generally also lift the heaviest weights. So take note of the 7 exercises that follow, and build your workout around these moves for best results. 1) Overhead press- nothing like putting a heavy load up over your head to show how strong you are. It is also a great way to build your shoulders, triceps, and a strong core. While skinny and weak guys work hard on lateral raises, lying extensions, etc, big and smart dudes hit it all and gain better by doing overhead presses. I would suggest that you stick to strict pressing for most parts and once in a while do push presses, where you use your legs to break through sticking points. It would also be ideal to do the press standing rather than seated for best results. 2) Weighted pull ups- no doubt doing heavy weighted pull ups, is one of the toughest exercises out there, but it is also one of the best that you can do to get a bigger upper body. Your back, biceps, forearms will get a lot bigger and you will be strong if you can do them right. The only problem is that a lot of guys can do only a few pull ups with just their bodyweight alone. If you are one of them then don’t worry, work at the bodyweight version first, and once you can do 10 strict bodyweight pull ups, you can do them with weights. The mistake however that I see many make with weighted pull ups is that they go too heavy. 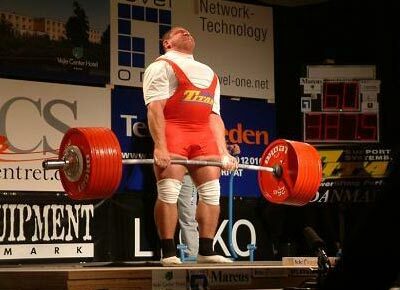 What happens then is that the trainee can only do partial reps, and does not get a great muscle building effect. Also often it means that the number of reps drop down drastically. Ideally to get the best from the pull ups and to keep your shoulders healthy never lift a weight that does not allow you to get atleast 6 full range pull ups. As you get stronger you can obviously increase the weight. 3) Bench press- probably the most loved exercise all over the world by those who wish to get big and strong. Often you will hear people in gyms calling out their partners or friends to a “bench press contest” to see who is stronger. The bench press will work all the pressing muscles and will also help to develop a lot of strength. 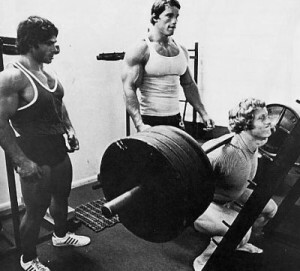 While nowadays some people criticise the bench press for not being “functional”, it should be kept in mind that if maximum size and strength is the goal then the bench is a great and necessary exercise. 4) Barbell row- I just love this exercise! It is one of the exercises that I can feel work best on my body. This exercise will work all the pulling muscles in your upper body, and is a great mass builder for your lats. Since it will develop your lats, you will also have a much better chance of having that great looking V shape. To do this exercise right, remember to keep the shoulders pulled back and focus on pulling the elbows back when you row. 5) Barbell squat- often called the king of all exercises, because not only does it give you great strength and size in the lower body, it also helps to build the upper body to some extent too. Yet, unfortunately a lot of “arms and abs” only trainees never perform this excellent exercise. That is a real pity because they have no idea what they are missing out on. A good squat workout will also help to develop a strong core, and improve conditioning too when done for higher reps. The major mistake people make with the barbell squat is that they will load the bar with too much weight and perform only quarter squats. Avoid this mistake and take appropriate weights so that you can get a proper range of motion. You do not have to go all the way down, but ensure that your thighs go to atealst parallel to the ground. 6) Barbell deadlift- I love this exercise because I can lift my heaviest weight in this exercise. It is also a very important exercise to ensure a balanced development since it works the muscles of the posterior chain. While most professional powerlifters can squat more than what they can deadlift, most trainees around the world will probably be able to deadlift more than what they can squat. The weight carrying capacity of this exercise is huge and so is the mass and strength building potential. While you may have heard horror stories of how the deadlift can injure your lower back, in reality proper form will keep you safe and make you strong. You can consider doing the stiff legged version too to hit your hamstrings harder. 7) Barbell cleans- in the old days the barbell clean was a favourite exercise of the big and strong men. They had no squat or power racks then, so to be able to clean a heavy weight on their shoulders was essential to be able to do heavy overhead press and squat with a good amount of weight. No wonder then that those old time strongmen had some very powerful and impressive traps to show for it. Unfortunately nowadays this exercise is not done the way it should be done. Either you will see guys who do high rep sets of cleans for conditioning or you will see people sticking only to light weights with this exercise. While this exercise may be the most technical in this list, it is still a great exercise to do. You can consider doing the hang clean version to make it a bit easier, and you can also mix it with a press or a jerk to get a better training effect. So there you have the super 7 exercises that will help you to get big and strong. You do not have to do all 7 exercises, but try to do atleast one press, one pull and one lower body exercise from this list and get very good at doing them. Very good would mean that you are able to lift a lot of weight in the exercise while still being able to maintain good form. As far as program design is concerned, keep it simple and you will do well. An example would be to select 3-4 exercises from the list on each training day and do each for 3-4 sets of 4-8 reps, while training 3-4 days a week. Along with that add sufficient calories, adequate rest and watch your muscles grow big and strong.